Next stop: the Stanley Cup playoffs. 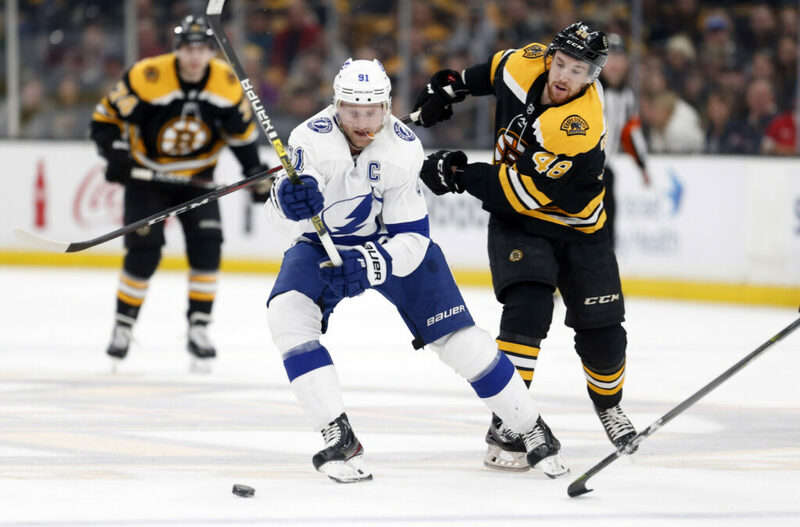 The Lightning matched an NHL record with their 62nd win, using a three-goal second period Saturday to beat the Boston Bruins, 6-3. Kucherov, Anthony Cirelli and Braydon Coburn each had a goal and an assist for Tampa Bay (62-16-4), which tied the 1995-96 Detroit Red Wings for most victories in the regular season. Steven Stamkos got a short-handed goal during the second, and Erik Cernak also scored during the period. The Lightning earned six of their wins in shootouts. The league introduced shootouts to decide ties after overtime at the start of the 2005-06 season. Before that games ended in ties after overtime, which was brought in for regular-season games in 1983. Kucherov finished with 41 goals and 87 assists, putting him in position to win the Art Ross Trophy awarded to the NHL’s leading scorer. He also broke Alexander Mogilny’s single-season record for points for a Russian-born player. Kucherov got his record-setting point when he assisted on Johnson’s 29th goal of the season with 1:26 remaining. Johnson raced to the net to grab the puck, then embraced Kucherov near the blue line in front of Tampa Bay’s bench. Trailing 2-1, Stamkos stole a pass and went in alone, shifting around Rask before tucking a backhander into the net midway into the second. Cirelli’s goal 4:07 later moved the Lightning ahead 3-2. Kucherov scored 53 seconds into the third. Boston jumped in front on Krejci’s 20th of the season 14:38 into the game. Charlie McAvoy was originally given the goal after collecting a loose puck and firing it at the net as Krejci was charging toward the front. BLUES 3, CANUCKS 2: Jordan Binnington stopped both shots he faced in the shootout, and St. Louis won at home. ISLANDERS 3, CAPITALS 0: Valtteri Filppula scored twice in his return from an injury, Robin Lehner stopped all 29 shots he faced and New York won at Washington to clinch home-ice advantage in the first round of the playoffs. SABRES 7, RED WINGS 1: Jeff Skinner scored twice to reach 40 goals for the first time and Buffalo won at Detroit. HURRICANES 4, FLYERS 3: Jordan Staal scored the go-ahead goal in the second period and Carolina hung on at Philadelphia for its fourth victory in five games. BLUE JACKETS 6, SENATORS 2: Pierre-Luc Dubois scored two goals and Columbus won at Ottawa, Ontario. RANGERS 4, PENGUINS 3: Ryan Strome scored 2:09 into overtime and New York won at Pittsburgh. DEVILS 4, PANTHERS 3: Travis Zajac scored the winning goal on a power play in overtime, lifting New Jersey at Sunrise, Florida. CANADIENS 6, MAPLE LEAFS 5: Ryan Poehling recorded a hat trick and added the shootout winner in his NHL debut as Montreal won at home.